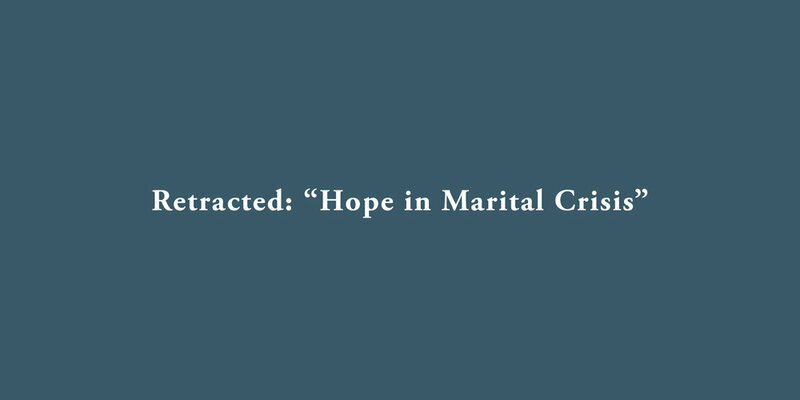 Retracted: "Hope in Marital Crisis"
The mission of Daughters of Promise is to encourage women in their faith and equip them for wholeness and freedom. We failed in this goal when we published the article entitled “Hope in Marital Crisis” in the Expectant issue. Daughters of Promise endeavors to give women a place to share their stories in the freedom of their own perspective. In the article in question, the author gave her perspective of attempting to cope and move forward after the damage wreaked by her husband’s crime. She experienced deep pain. However, the piece minimized the incredible pain of the victim and full devastation of sexual crime. We appropriately earned feedback of anger, disappointment, and concern. Sexual abuse of a minor is not an inappropriate relationship. It is not an adulterous relationship between two consenting adults. It is abuse, evil in God’s eyes, and a crime. We were wrong to publish such a phrase used as a euphemism; it did not own the truth. The author was not trying to tell the vulnerable girl’s story. However, by publishing a phrase that labeled her as an outsider and without recognition for her own incredibly difficult journey of recovery, we wrongly communicated that the victim is less important than the perpetrator’s family. Sexual abuse leaves deep wounds. Repentance and forgiveness is possible after such devastation; however, forgiveness and trust are distinct from each other. By minimizing accountability and safety measures, we wrongly blurred the differences between repentance, forgiveness, and trust. We were in error to publish the article in its current state. Because of its damaging messages, we are retracting the article. Our retraction will be placed in remaining unsold issues and communicated to our subscribers across social media and in print. We are working to strengthen the editorial process for the future. We have grieved the pain we caused by mishandling a sensitive subject. We are deeply sorry for the damage this article has caused and the painful emotions it has raised. Especially to survivors and those walking closely with them: we are so sorry. We thank those who gave us feedback and brought the errors of this article to our attention. We welcome your questions and feedback using the form below, or via direct email: hello@daughters-of-promise.org.